Violinist John Lindsey holds the State University of New York's (SUNY) highest rank, Distinguished Service Professor Emeritus (2009). Previously he was awarded the 1993 SUNY Potsdam President's Award and the 2003 SUNY Chancellor's Award, both for Excellence in Teaching. He has taught full time in the Dallas (TX) Public Schools, Baylor University, The University of Kentucky and at the Crane School of Music (1981-2016). 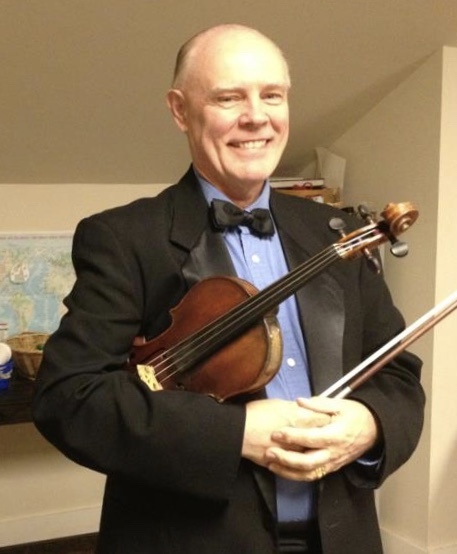 Mr. Lindsey is currently the founding Concertmaster of both the Orchestra of Northern New York (31 years) and the Eleva Chamber Players (12 years). In 2012, he presented a recital and Master Classes at the Shenyang Conservatory in China. In the summers, he has been an artist faculty member of the National Music Camp (Interlochen, MI) for 4 years, the Ameropa Festival in Prague (CZ) for 5 years, The Governor’s School of North Carolina for 12 years, the Woodstock Mozart Festival (VT) for 17 years, The Ithaca Chamber Music Institute (NY) for 25 years, the Interlochen Adult Chamber Music Camp for 30 years, the 1988 Stage de Musique in Marcillat-en-Combraille, France, The 2000 Canna International Fesitival in Canna, Italy, The 2008 Bulgarian International Chamber Music Festival, the 2013 Columbia National Youth Orchestra’s Annual Retreat in Santa Marta, Colombia, and the prestigious 2014 Vianden International Music Festival at Vianden Castle in Luxembourg. In May, 2019 John and his wife will reopen their Bed & Breakfast renamed the KhoomPenJun B & B. It is the only Thai style B & B in all of North America.